My restored 1973 Airstream--home for over two years now. Living in a space with less than 200 square feet requires far less energy to heat and cool. The tiny space requires less cleaning materials and demands the accumulation of less stuff. 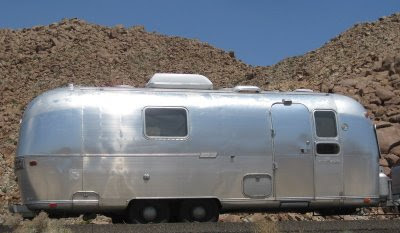 The Airstream also took less materials to build than a traditional home. Re-using an older trailer cut down on the demand for new materials. My Dodge diesel truck gets about the same mileage as my previous car, a Subaru, and I drive about the same number of miles as I did when living a more traditional life--though my goal is to drive even less.